In the previous article in this series, we walked through creating an iOS app, adding a mapview to it and displaying points of interest on it. When the user’s location changes and when the app first loads, we communicate with the PHP service we set up in the first article, to get all of the points of interest within a number of meters from a certain latitude and longitude. Today we’re going to look at adding new points of interest. This actually involves an interesting dance between the client application and the cloud. We’ll discuss that first. If you haven’t already done so, you’ll need to go through part 1 in this series to set up a Windows Azure Website running the PHP service. To do this you will need to have a Windows Azure account. If you don’t already have a Windows Azure account, you can sign up for a free trial here. Once you’ve deployed that site, you can come back and proceed with this walkthrough. If you would like to jump ahead and just pull down the source code, you can access it in this GitHub repository. Note that you’ll still need to follow the instructions in the readme and configure your app. One final note: this walkthrough was done with iOS 5 and the Map View element provided by it. I haven’t tried running it on an iOS6 beta yet and that does have new mapping capabilities. This steps described below may need to be altered slightly to work with iOS 6 maps. The first thing we need to do is have our client app communicate with our service running in Windows Azure Website and request a Shared Access Signature (SAS). A SAS is a way around needing to have the account name and key of our storage account on the local device. If you were to put the account name and key in your client app and someone was able to pull those details out, they could then upload and access whatever they wanted in your storage account. The way around this is by using the SAS. A SAS is created to give an application the ability to upload a file to a storage account without having the name or key. Instead, a server side component has the name and key and requests the SAS from the storage account. This SAS is a URL which expires after a certain period of time (chosen by the server side component) and gives a client application the ability to upload a single file. So, our client app requests the SAS from our website. The website talks to our storage account and gets the SAS. The SAS is then returned to the client application. 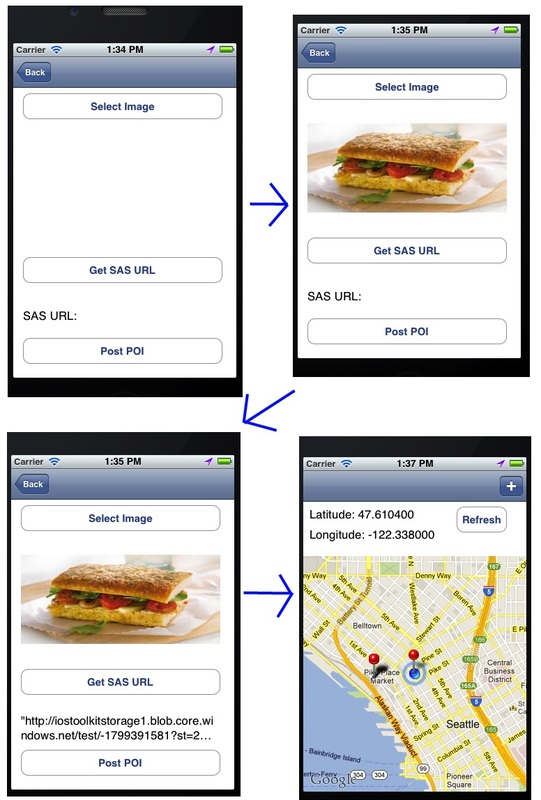 The client app can then use the SAS URL to upload a file. After that is done, we save the point of interest (with a reference to the URL of the item uploaded to storage) inside that point of interest. Let’s get to our code and see how we can accomplish this. First the init method which initializes the callbacks object. Next is postToUrl. This method acts as a catch all for any sort of HTTP request (yes we could pass in other optional parameters and expand this, but for today’s work, it will do). As parameters, we can specify the URL to connect to, the data to post (optional), the type of HTTP request, the content type (optional), and a callback block. We generate our NSMutableURLRequest and set any necessary parameters. Then we start a NSUrlConnection. Lastly, we save this information to a StateObject and put that in the callbacks object. The reason we’re using the StateObject and saving it like so is that it makes this class capable of handling multiple requests at the same time. The key we use in the callbacks object is the hash of the connection. So later in the file, when we receive data back, we can tie that back to the StateObject specific to the request by using the hash. The next few methods are all part of the NSUrlConnectionDelegate protocol. First in didReceiveReponse we just check the response code for an error and log it. In didReceiveData, we pull out the StateObject using the connection’s hash and then append the data that was received. In didFailWithError, we log the error and then remove the StateObject from callbacks so we’re not leaving memory out there and the connection is now dead. Lastly, in connectionDidFinishLoading, we pull out the StateObject and call it’s callback block before removing the StateObject from callbacks. 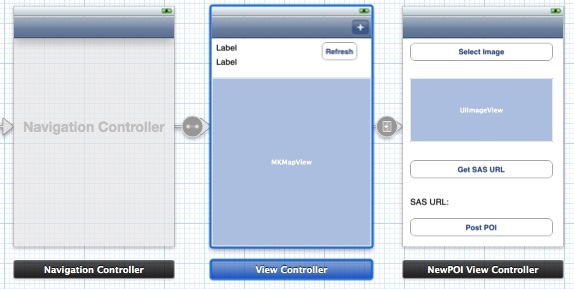 Also, add a new Objective-C class to your project, make it subclass UIViewController and name it NewPOIViewController. We won’t edit that file now but need it for part of our UI work. Now that we’re done with the plumbing, let’s alter our UI so we can add a new point of interest. Open up MainStoryboard.storyboard. We left off with a single view tied to ViewController. Go ahead and select that view and go to the Editor menu and choose Embed In and Navigation Controller. You should see your storyboard change so now there is a Navigation Controller which points right to your view controller. A NavBar has also been added to your view controller. Zoom back into your view controller and drag a Bar Button Item from the UI element selector in the bottom right panel to the top right of your view controller’s navbar. This button will by default have the title “Item”. In the Attributes Inspector at the top right of the utilities pane, choose the Identifier drop down and select “Add”. You should see the button change to having a Plus in it. Now it’s time to do all the implementation. This looks more complicated than it is. First we get an instance of UIImage to store the image and get a NSData object with a PNG representation of the data in it. 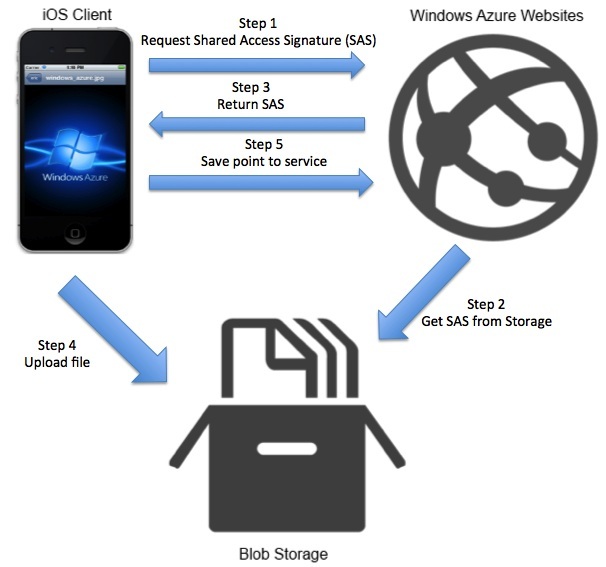 We then use ServiceCaller to post the image data to Windows Azure Blog Storage using the SAS URL we got in the previous step. The callback for that will set the label to be that call’s response first. We then get the URL string with out the SAS specific stuff and store it into poiUrl (this is the public URL of the object that we can go to in a browser to view our image). Then we build a NSDictionary with all of the data for our point of interest: the image name (defaulted to “My Image”), a UUID (dynamically generated by the method at the bottom), the latitude and longitude (fetched from NSPreferences), a type (defaulted to “1” for image), and the URL to the image in blob storage. We then use NSJSONSerialization to serialize the data into an NSData object. We use ServiceCaller again, but, we’re posting to our PHP service this time with the JSON data describing our point of interest. Finally in that post’s callback, we are popping the view controller so the user will return to the map view. We select an image first. Then we get the SAS URL. Finally we post it (which handles both uploading the image to blob storage and the point of interest data to our service). With that done we return the user to the map and refresh the points of interest near our current location. Now we see that the original point from yesterday and our new point are showing up. 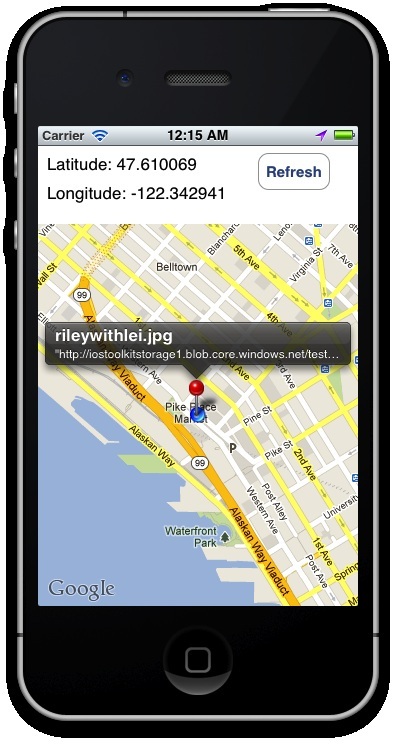 Today we finished our iOS Geolocation app. In doing so, we made more connections to our PHP service running in Windows Azure Websites in addition to using Windows Azure Blob Storage for storing images. We also saw a fairly nifty way to handle doing web requests that will handle their own callback code without continually having to implement NSUrlConnectionDelegate. I hope this has proved informative and has given you some solid understanding of how to create iOS applications with geolocation components powered by Windows Azure. As mentioned at the top, you can access the source code for the full version of this app on GitHub. Remember to configure the subdomains in the Constants.m file before trying to run it.